Max Huckle is an artist. 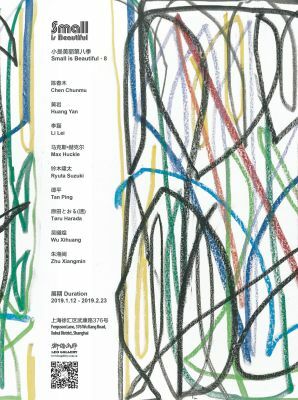 At the beginning of the new year of 2019, Leo Gallery Shanghai proudly presents the group exhibition “Small is Beautiful·8”. Leo Gallery’s annual themed exhibition “Small is Beautiful” has reached its 8th edition this year. The exhibition included a variety of art forms by nine artists from China, Germany and Japan.By presenting the diverse art expression of the artists, the exhibition theme “Small is Beautiful”conveys our aim to discover another precious perspective of smallness that is always overlooked. Chen Chunmu creates a curious structure through fluid painting techniques, expressing the parallelism of reality and imagination, and allowing the audience to understand his unique visual world; The recent work of Huang Yan places together images of traditional Chinese painting and techniques of Western oil painting, acting asa redefinition of traditional literati art in the contemporary context; Poetic,passionate and rational, Li Lei’s work is infused with the rhythm of life，as well as the spiritual consolation of the artist; In the work of German artist Max Huckle，one can perceive his purse for freedom through his contemporary techniques, as his works are always oriented by instinct and intuition, challenging the highly academic phenomenon in the world of art; And when viewing the work of Japanese artist Ryuta Suzuki, one will be moved by its inheritance of traditional Japanese art, as the dynamic Ukiyoe-like work challenges the traditional cognition of the masses; The constant attempt to “do subtraction” is the core of Tan Ping’s creation. Through the change of style to the most simple and pure, his work enters the stage of pure personalization;Japanese Artist Tøru Harada is good at finding material and inspiration from everyday street, as the materials from everyday life, the minimal structure and the stylized application of rough line make his work special; Wu Xihuang bases his paintings on his novel, constructing a shrewd narrative picture through piecemeal plots; In the work of Zhu Xiangmin, character prototype becomes ambiguous, outside the seemingly chaotic boundary of nature, the reconstructed character encounters external substance, carrying a kind of spiritual pursue that goes beyond freedom. Perhaps macroscopical art narratives are heart-stirring, but these small creations of art can also be the forces of a heartbeat. In the first-floor exhibition space of Leo Gallery Shanghai, we look forward to bringing to you the wonders and feelings of the world through these small and beautiful art creations.